This pretty embroidered dress comes in two color options for you to choose from. The Not That Innocent Embroidered Mesh Overlay Dress has a classic fitted sheath cut and half sleeves. 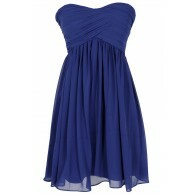 It is fully lined below the bust but is semi-sheer at the neckline, sleeves, and top back. The bust is lightly padded for suupport. This dress is made of a semi-sheer mesh overlay with embroidered designs throughout. We love the scalloped hemline at the bottom of the dress as well as on each sleeve. A hidden back zipper completes this dress. The Not That Innocent Embroidered Mesh Overlay Dress looks nice paired with pumps, wedges, or strappy heels. The ivory version of this dress would make a cute rehearsal dinner dress or bridal shower dress. Details: Lined. Lightly padded bust. Hidden back zipper. 100% polyester. Lining: 100% polyester. Dry clean only. Small measurements: Length from top of shoulder to hemline: 34". Bust: 32". 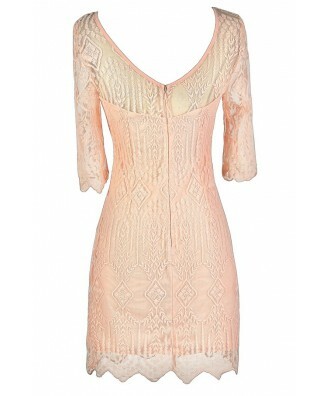 You have added Not That Innocent Embroidered Mesh Overlay Dress in Pale Pink into Wishlist. 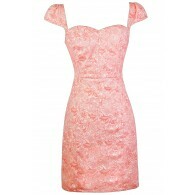 You have added Not That Innocent Embroidered Mesh Overlay Dress in Pale Pink for Stock Notification. You have set Not That Innocent Embroidered Mesh Overlay Dress in Pale Pink as a loved product. You have removed Not That Innocent Embroidered Mesh Overlay Dress in Pale Pink as a loved product.